A new nemacheilid loach, Lefua tokaiensis sp. nov., is described from the small mountain streams in the Tokai region, central Honshu, Japan. Lefua tokaiensis is distinguished from all other species of Lefua by the following combination of characters: eyes located dorsally on the head, presence of a narrow conspicuous longitudinal mark between the base of the outer rostral barbel and the eye, absence of a rhomboid or triangular dark blotches on the middle of the caudal fin base, absence of a black longitudinal stripe on both body sides in mature males, absence of dusky cross bars on the dorsal area of the body, absence of a dusky bar beside the dorsal fin base, typical presence of small dark spots on the dorsal and caudal fins, presence of the obscure dark band in skin of the caudal fin base, caudal fin slightly squared off at the apex, and modally four hypurals. This article was registered in the Official Registry of Zoological Nomenclature (ZooBank) as B4FA0DBD-C0E6-4D8C-A12C-C04C73501E2D. This article was published as an Online First article on the online publication date shown on this page. The article should be cited by using the doi number. 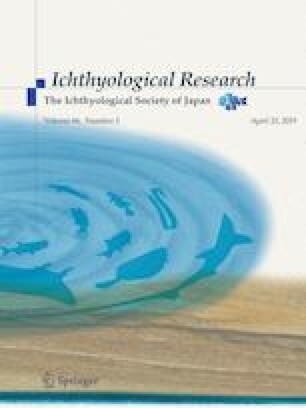 We are grateful to M. Sugiura, T. Asaka, T. Morishita, and M. Takemoto for collecting several specimens and data to clarify the total variance of L. tokaiensis, and M. Matsushita for drawings of the holotype of L. tokaiensis. We sincerely thank M. Matsunuma (KUN) for observations of materials under his care.